Expanding your library of games on the new SNES Classic is not only possible, it’s trivially easy. Though it may not be entirely legal. Not long after the NES Classic Edition came out, a Russian coder named Cluster built a tool called Hakchi to cram more games into the little emulation box. Given that the SNES Classic Edition has most of the same off-the-shelf parts as its predecessor, it was only a matter of time before an SNES-friendly version came along. The kinks have been ironed out of the early builds that began circulating last week. Hakchi 2 is here, and it’s unbelievably simple to use. The missing ingredients not included with Hakchi are the games themselves—easily downloaded if you know where to look. But game ROMs occupy a fussy gray area, legally speaking. In some circles downloading a digital copy is thought to be kosher if you own the game in some other form (the original cartridge, for example). Nintendo, however, is particularly inflexible in its stance against ROM use. In that regard, load up an SNES Classic at your own risk. For the sake of argument, lets say you have an extensive library of SNES games: the SNES Classic has 256MB of onboard storage. With most game ROMs clocking in around 2mb each, it won’t fit all 700+ games made for the console but there’s more than enough room to add the fan favorites missing from Nintendo’s baked-in roster. In case you’re wondering, Hakchi can add games from other consoles—in that they’ll display in the menu—but the emulator in the SNES Classic won’t know what to do with them and kick you back to the menu almost immediately. 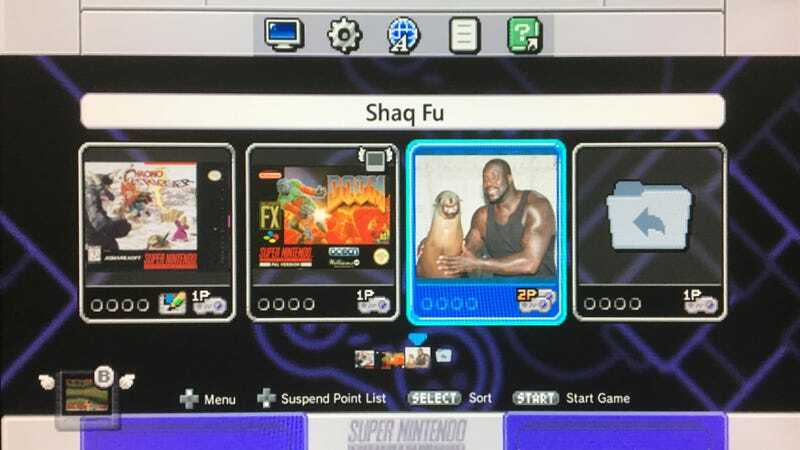 What games would you add to the SNES Classic if you were, hypothetically, going to use a piece of software to semi-legally expand the library on it? Tell us in the comments. We’re not cops.